The plazas de soberanía ('places of sovereignty') are tiny Spanish sovereign territories in North Africa. These are separate pieces of land, peninsulas (peñóns) and islands scattered along the Mediterranean coast bordering Morocco. Most of these territories came into possession of Spain in 1492 when they drove the Moors out of southern Spain, a moment still remembered as the Reconquista. Others were occupied during the various wars that followed. 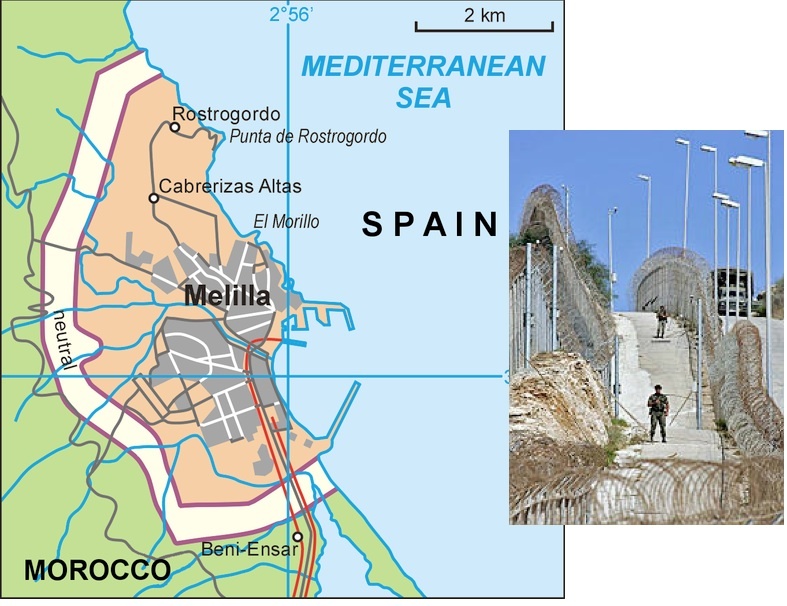 The territories are usually divided into four groups: the cities of Ceuta and Melilla, the Islas Alhucemas (consisting of Peñón de Alhucemas, Isla de Tierra and Isla de Mar), the Islas Chafarinas (consisting of Isla del Congreso, Isla Isabel II and Isla del Rey) and the Peñón de Vélez de la Gomera. 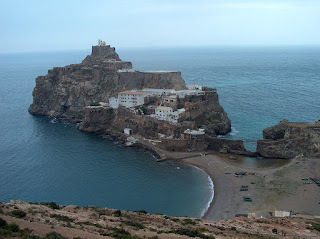 Next, there is the disputed Isla Perejil, a small uninhabited islet close to Ceuta, considered by Spain to be a part of Ceuta and not a territory in its own right. The Isla de Alborán is another small island in the western Mediterranean, about 50 kilometres from the African coast and 90 kilometres from Europe. 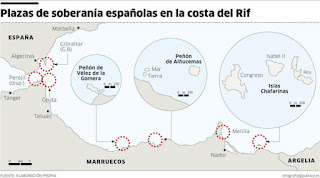 Some Spanish maps even include Gibraltar to their 'places of sovereignty'. 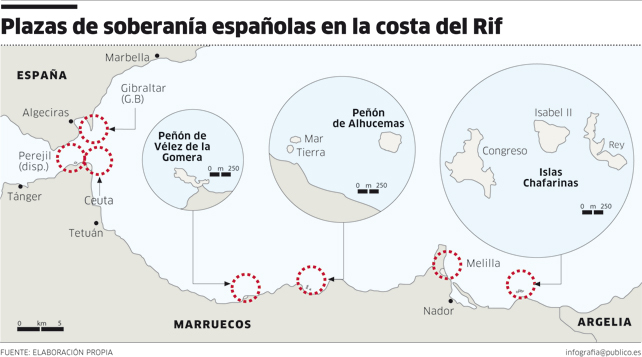 The problem is that, because these territories are part of Spain, they also are part of the European Union. The cities look like war zones, heavily guarded and surrounded by barbed wire. 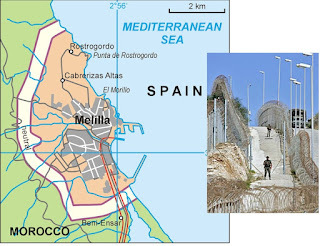 But desperate people always retort to desperate actions, which means that they go to great lengths to illegally enter Ceuta or Melilla. They have then safely entered in the European Union. So, why doesn't Spain cede these territories to Morocco? They are of little economic or strategic importance anymore. Like so often the reason is Iberian pride. Spain ceded Gibraltar to Great Britain in 1713, but now wants it back (but has no legal right whatsoever), does not want to cede the towns of the towns of Olivença and Talega (occupied in 1801) to Portugal, but does want to retain those pesky little territories in or near Morocco. Whatever the (human) costs.